FATTY ACIDS: GOOD OR BAD? What are fatty acids? Here we are basically talking about fats! We have monounsaturated, saturated,trans-fatty acids, omega 3 fatty acid, and omega 6 fatty acids found in foods. So what is healthy for you? Monounsaturated and polyunsaturated fats(omega 3 and omega 6) are considered healthy and trans-saturated fats are unhealthy. Trans fats are included in pastries, cakes, donuts, packaged desserts, and all things that we consider yummy! They may be yummy tasting, but they do not provide any positive effects on health. In our diet we must concentrate on incorporating good fats as some fatty acids are essential meaning they can only come from the diet. I am sure most of you have heard of omega 3's and omega 6 fatty acids. Maintaining the balance of these two fatty acids is key to being healthy. However, in order to get these into the diet we must consume foods that are rich in them as our body can produce the essential fatty acid precursors for the important omega 3 and omega 6 fatty acids. In the population today we have a high intake of Linoleic acid (LA) which comes from vegetable oils and we have a low intake of fish which is rich in omega 3 fatty acids. Omega 3 fatty acids are essential as they decrease inflammation, reduce risk of Alzheimers, heart disease, and obesity. We must increase our intake of Alpha-linoleic acid which are rich in fish and flaxseed oils to increase our omega 3's. 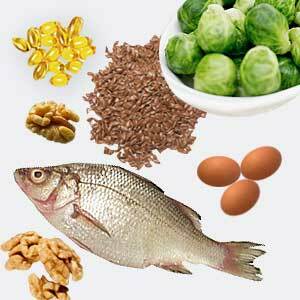 High intake of some omega 6 fatty acids can have the opposite effect of healthy omega 3's by increasing inflammation. High intake of omega 6 fatty acid increases levels of arachandonic acid which can increase inflammation since it is a precursor to the inflammatory pathway. So in order to avoid detrimental effects to the body we should balance the two important fatty acids. The ratio should be omega 3 to omega 6: 2/1 or 4/1. How do you add these into your diet?? Always consult with your doctor before beginning any diet regimen. You can slowly introduce these foods in your diet and you can also take a fish oil supplement to increase omega 3's. Flax seeds are great to sprinkle on cereal or yogurt. Walnuts can be a great addition to salads! Add these healthy foods to get those omega 3's up and I guarantee your body will thank you! this is a blog about the mad diet, a personal log following me through my progress on the mad diet, and my personal thoughts and ideas about healthy living, dieting, and working out.